Please complete the information below. A Name Badge cost $8.00 each. 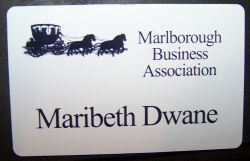 The Name Badge is white with black lettering with a magnetic catch. Please include a printed copy of this page.